"...Let's get out of this town, drive out of the city, away from the crowds..."
New York City in the fall is basically the best. The skies are my absolute favorite shade of blue, the crowds leave the streets and head to the bars for football games, and I get the parks to myself, with my chai tea and Kindle. But it's always worth heading out of the city as well. 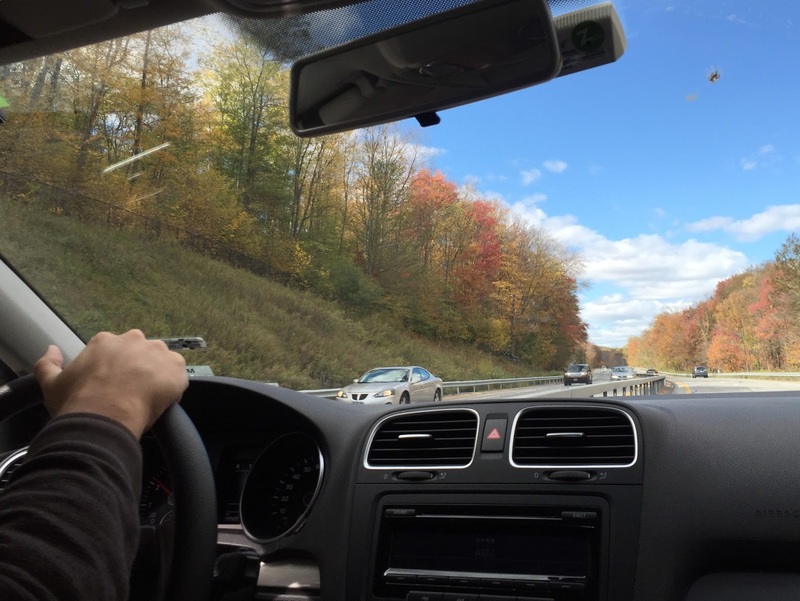 Earlier this season, Ryan and I got out of town and drove a Zip Car upstate to explore. Our first intended destination was a classic hot dog stand an old friend told me about years ago. According to Apple Maps, this was on the way to the second destination, but when we got "there," we were in a neighborhood. This is why you don't use Apple Maps. Turns out the eatery was on the opposite side of the Hudson than where we wanted to be for the rest of the day, so it was a good thing we were not brought there. We contemplated eating McNuggets because we were so hungry and wanted to get back on the road quickly, but we found Savannah's Southern House and "settled" on chicken & waffles and buffalo chicken sliders. It was a much better choice for the rest of the day. 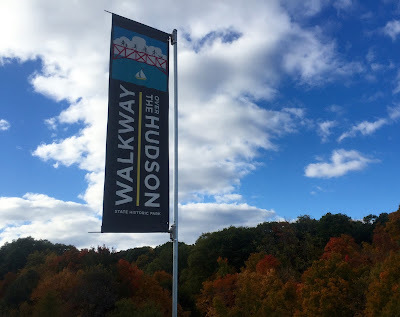 We switched to Google Maps and typed in Walkway over the Hudson, a mile-long bridge across the Hudson River in Poughkeepsie. The walkway, an old railroad bridge, opened in 1888, making it the longest bridge in the world at that time. 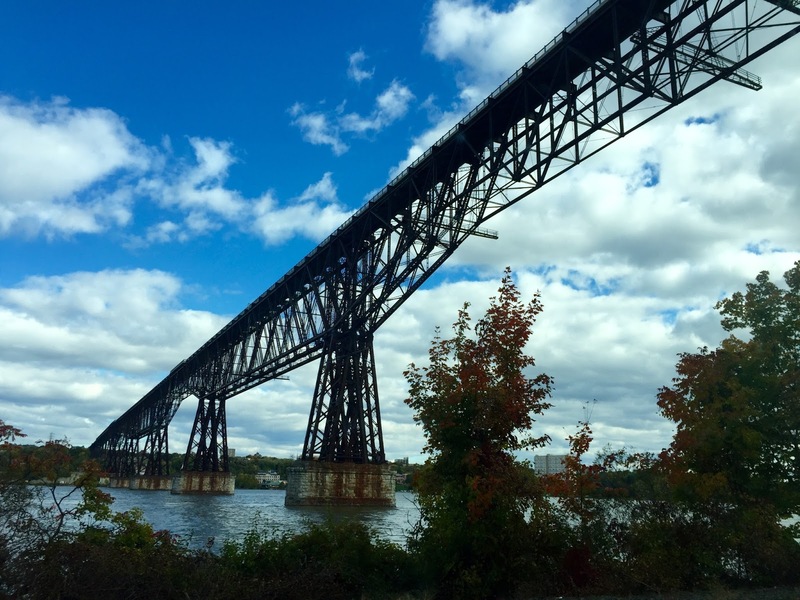 During World War II, the bridge was crossed by troops who were heading overseas, and at times throughout history, the bridge carried up to 3,500 train cars a day. I'd been wanting to visit for a number of years, since I first heard about it. I almost got a chance to walk across on my trip last year hosted by Dutchess County Tourism but it was ridiculously cold that day, so the schedule changed. I was glad to have waited for a beautiful day instead. Instead of taking us to the walkway itself, Google Maps decided to take us to the river underneath the bridge. This is why you don't use Google Maps. Granted, it wasn't *completely* wrong, like Apple Maps had been, but we didn't have our jetpacks with us and we couldn't see another way to get up from where we were. It wasn't too far to drive to the correct place where the walkway actually starts and park. Walkway over the Hudson sure was beautiful. The colors in the trees were just starting to change and you could see for miles, which is something I appreciate greatly when I'm not in the city. Unless you're on top of the Empire State Building or the like, you can only see ahead a few avenues or so due to the skyscrapers. It was windy and chilly on the day we chose to go, but the view and the company was magnificent and there were TONS of puppies to lust over. After about an hour of walking around above the Hudson, we got back in the car and searched for an apple orchard. Apple picking is *the* fall activity for the social media generation. I'd never gone, and given the fact that I only eat two apples a year, it was fine, but Ryan and I had this crazy craving to make apple pies that week. My dad's apple pie recipe is world-famous family-famous. I was willing to eat more than two apples this year in exchange for the experience. We ended up at Wilklow Orchards where we ate apple cider doughnuts and talked to goats before heading out to the apple trees to make our selections. Although we'd visited a little late into the season, there were plenty of perfect apples to choose from. We picked about 1,000 different varieties to make our pies taste amazing - including Macintosh, Winesap, Golden Delicious, and Gala. We also may or may not have eaten a few small guys while out in the orchards which may or may not have been the best apples I've ever tasted. The only thing that's bad about taking a car out of the city is that at some point, you have to come back and you inevitably sit in a ridiculous amount of traffic, which delays your pie making and you have to set an alarm for 3 am to get the pies out of the oven so your apartment doesn't burn down. But oh my, that pie.